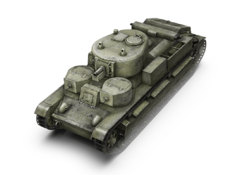 The T-28 tank was developed by the Experimental Machine Design Bureau of the Voroshilov plant. The vehicle saw service on August 11, 1933. A total of 503 tanks were manufactured at the Leningrad Kirov Plant between 1933 and 1940. During mass production, the T-28 tank underwent a number of changes in design and modifications. The vehicles were used in the war with Finland in the winter of 1939–1940 and at the beginning of WWII. This page was last modified on 9 November 2015, at 03:19.